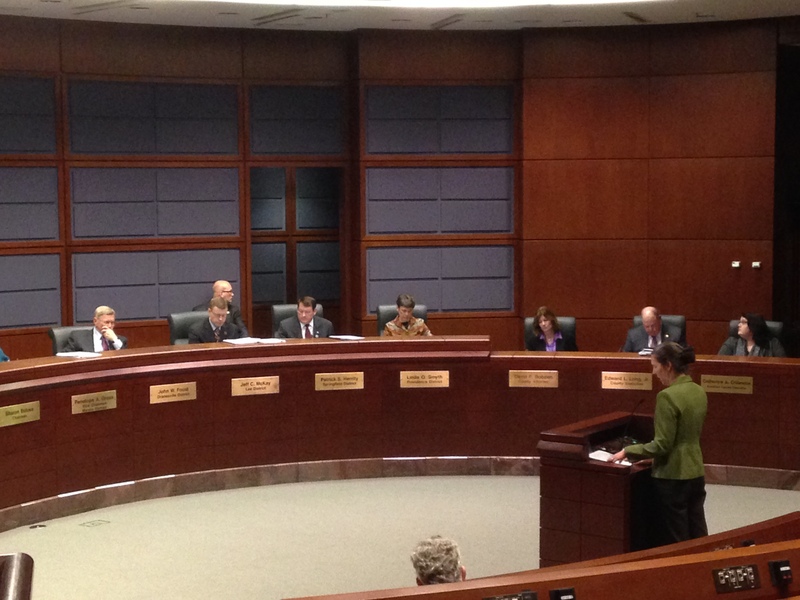 Last Thursday afternoon SCAN’s Executive Director, Sonia Quiñónez, spoke before the Fairfax County Board of Supervisors at one of its public hearings on the county’s FY 2016 budget. The FY 2016 budget proposed by Fairfax County Executive Ed Long makes devastating cuts to the county’s child abuse prevention services. Sonia called on the Board of Supervisors to maintain current local funding for Healthy Families Fairfax, Good Touch/Bad Touch, and the Parent Education Program, emphasizing that funding child abuse prevention services is not just the right thing to do; it is also a smart, efficient use of local taxpayers’ money. The county executive’s proposed budget for FY 2016 would completely eliminate local funding ($1.6 million) for Fairfax’s Healthy Families program, a program backed by decades of research showing that it decreases incidences of child abuse and neglect, improves maternal and child health outcomes, and improves parent-child bonding, children’s cognitive development, and school readiness. The Healthy Families program is among the most reputable home-visiting child maltreatment prevention programs, specifically serving parents-to-be and new parents who have been determined to be at high-risk of child maltreatment. Since Healthy Families Fairfax (HFF) began 1991, it has served over 3,000 at-risk families. In its 24 years, less than 1% of the families served by HFF have been identified in “founded” cases of child abuse or neglect. The county executive also proposes completely eliminating funding ($85,000) for the Good Touch/Bad Touch program, the only county-wide program that teaches children about body safety, sexual abuse, and protective skills. Even the Parent Education Program, which offers parenting classes to parents, 34% of whom are referred by Child Protective Services and Foster Care and Adoption, could lose approximately 50% ($216,000) of its funding from the county in the proposed budget. We at SCAN are very concerned about how these cuts would impact vulnerable children in our community. If the Board of Supervisors agrees to eliminate funding for HFF, over 600 families in our community, who are at high-risk of child maltreatment, will lose services. If it eliminates funding for GTBT, the need for child-centered education about sexual abuse and prevention may go unmet. And if it cuts funding for the PEP in half, 200 families with 255 children will no longer have access to parenting classes. As if the damaging impact to vulnerable children and families was not enough, SCAN believes that these cuts will negatively impact the future of our community as a whole. It costs Fairfax County $3,473 per family to serve a family in HFF, which all but eliminates the chance that their children will be abused or neglected. It costs the county just $1,480 per family to provide parenting classes. SCAN worries that, without HFF, GTBT, and PEP, more children in our community will experience abuse and neglect, and end up in foster care or worse. Fairfax County spends an average of $78,658 per child in foster care placements. The Centers for Disease Control estimates that over the course of an individual’s life, the community spends $210,012 per victim of nonfatal child maltreatment, and $1,272,900 per death due to child maltreatment. SCAN will continue to advocate for the protection of local funds for child abuse prevention services in Fairfax County, as well as in Prince William County, where the county executive has also proposed completely eliminating local funding for Healthy Families Prince William. YOU CAN ALSO MAKE A DIFFERENCE! Fairfax County and Prince William County residents can contact their representatives to their board of supervisors and call on them to maintain funding for child abuse prevention programs. Non-residents can help by spreading the word to family, friends, and coworkers who live in Fairfax or Prince William counties.